Power systems use either DC (Direct Current) or AC (Alternating Current). Let’s delve on these technologies. A power plant is feeding a house located over 1000feet away. The house demands 100Amps current at 480V. 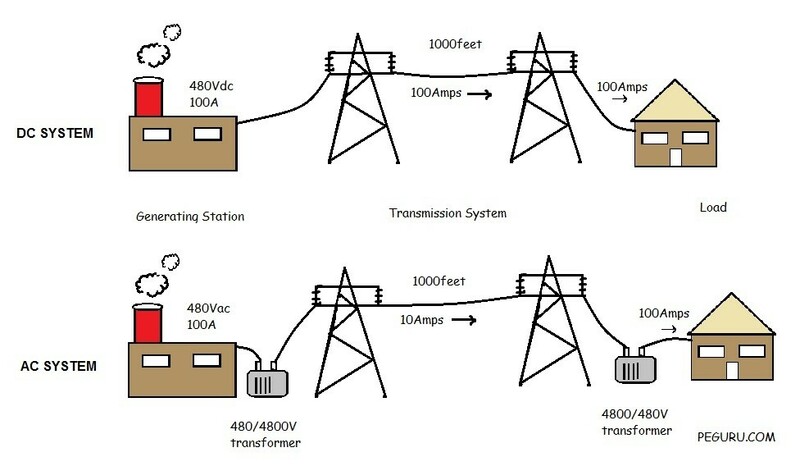 Assume a DC system and a AC system with the AC system employing a transformer rated 480/4800V near the generating station and a 4800/480V transformer near the house. See figure below. Let’s see how a DC system stacks up against an AC system. 1. To carry 100Amps over the line, a larger cable (in diameter) will be required for the DC system. 1. After transformation, the current on the power line will be 10Amps. A smaller cable will be required. Voltage Drop (VD) across the line = 0.15*100 = 15V. Voltage Drop (VD) = 1.5*10 = 15V. Same as a DC system. 3. The DC generator must generate 480V plus 15V to deliver power to the house. At the house, the voltage, therefore, will go from 495V at no-load to 480V at full-load. A 15V variation. 3. 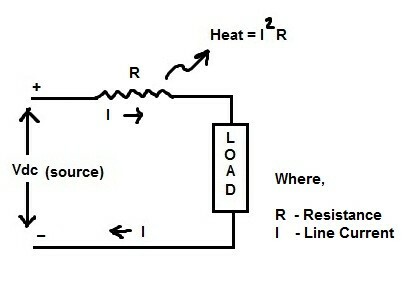 Allow taps on transformer to raise the voltage by 15V to obtain 4815V. At the house, this is equivalent to 481.5V. A 1.5V variation from no-load to full-load. 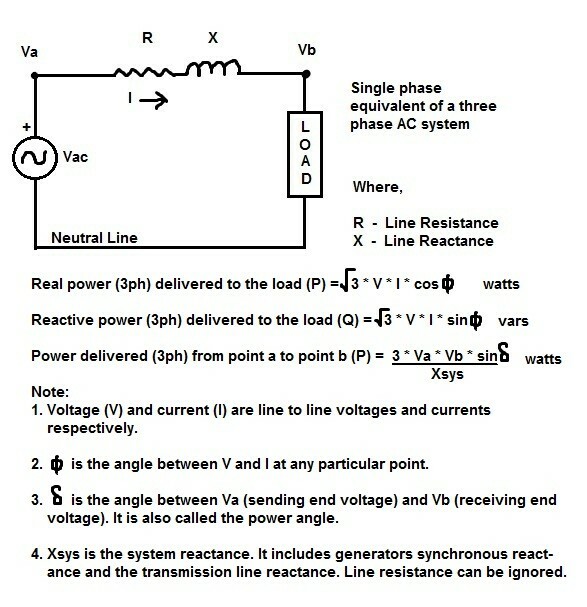 Engineers call this variation of voltage as the Voltage Regulation (VR). An important factor in the power system. The less the VR the better the system. 4. Losses in transmission system (in watts) = 15*10 = 150 watts. Ten times less than DC transmission. 5. Transformers cannot operate with DC supply wired to it. The only way to step down voltage for distribution is through a motor-generator set or a rotary converter – an inefficient process. 5. Transformers operate at 99% efficiency at full load. Used through out the AC system. Clearly, a DC system cannot be applied to all areas of power system. They have critical issues in distributing power to customers who have loads with different voltage requirement. The current technology renders it inefficient. At high voltages and long distance transmission, DC systems are favorable. With fewer conductors and cost savings from transmission infrastructure, High Voltage Direct Current (HVDC) system can be implemented as a highway for bulk power transmission. Losses incurred in a DC system are purely resistive. They are emitted as heat, given by I²R (Joules). Simple system. Easy to understand. No abstract concepts involved unlike AC systems. Suitable for HVDC transmisson. Fewer t-line conductors required to transmit DC power. Can be used to link two asynchronous AC systems. Under sea power transmission is feasible using DC lines. It does not have capacitive effect like AC lines have under sea water. DC currents do not fibrillate your heart like AC currents do. It just stops it. Heart fibrillation is dangerous than a heart that has stopped beating momentarily. DC system is not suitable for distributing power. HVDC systems currently in operation are derived from AC systems using expensive converter stations. Cost savings from reduced transmission lines (especially long distance ones) in a HVDC system go to building the expensive converter stations. Click on the image below if you fancy AC power equations. AC Current unlike DC current is a time varying quantity. This has major implications. AC currents now not only have to deal with resistances but also with opposition offered by the inductive nature of transmission lines. 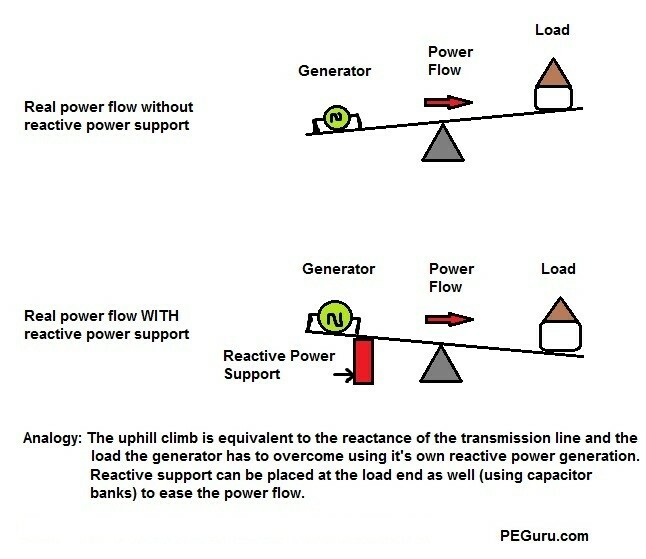 The real power described in the equation (to the left) does the real work in the power system. It’s what drives the motors, lights the bulbs and so forth. The reactive power on the other hand does nothing. It only facilitates the transfer of real power. How? See figure 4 for explanation. Without reactive power support to long transmission lines (from the generators, capacitor banks, etc.) there will be a significant voltage drop at the end of the lines. A voltage drop at your receptacles is not what you want in the house. It damages equipment. a three phase system than a single or two phase system but there is no advantage in using more than three phases. It is the break-even point. Employing more lines equates to higher infrastructure costs. AC currents oscillate 60 times a second (in USA). This is in the electrical domain. In the mechanical domain, this equates to 1800 rpm for a 4-pole generator. If more than one 4-pole generator is connected to the power grid then all these generators must “swing” at 1800 rpm to produce AC power at 60Hz. Failure to do so will cause the generators to trip and shutdown leading to a system blackout. More on this in another article. Very flexible system. It can deliver power to loads over vast distances using transformers. AC generators are sturdier and easier to build than DC generators. DC generators need brushes and commutators to generate DC current. Very hazardous. Susceptible to voltage surges. Complex system. Computer with power system analysis software has saved engineers. Nice comparison… This is exactly the reason we ended up with AC instead of DC about 100 years ago! However, you are rather comparing a low voltage network with a high voltage network and not AC with DC. If you consider also an AC system without the transformers, you will see that it is not the DC itself that gives the increased losses… Today there are efficient ways to do the same increase in voltage with DC/DC converters that will make sure you will have lower losses in your DC system than in the AC-system! Thanks, for a home solar PV system the latest technology gives DC output. Is it still efficient to have for example two strings of 21a DC over 200feet using #8 THHN cable? or is it better to run (post inverter) AC on one string with 42a on #4? Great explanation-especially for someone like me who is in the industry but not an Engineer. Looking forward to reading more! Good, simple explanation and illustratration of difference in ac and DC systems. Very helpful and informative even for a non-professional. Thanks a lot for the post. Thanks for this posting. It is really helpful.